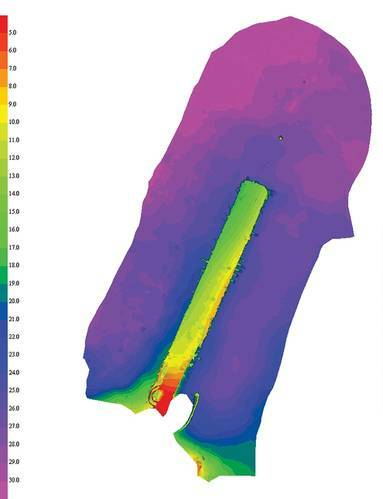 Figure 4 Multibeam image: side view of dock, no singlebeam. Dock is broken away from pilings on the right, and slanting down. Pilings on the right still present, some penetrate above the water surface. Most pilings on the right are submerged and not visible. 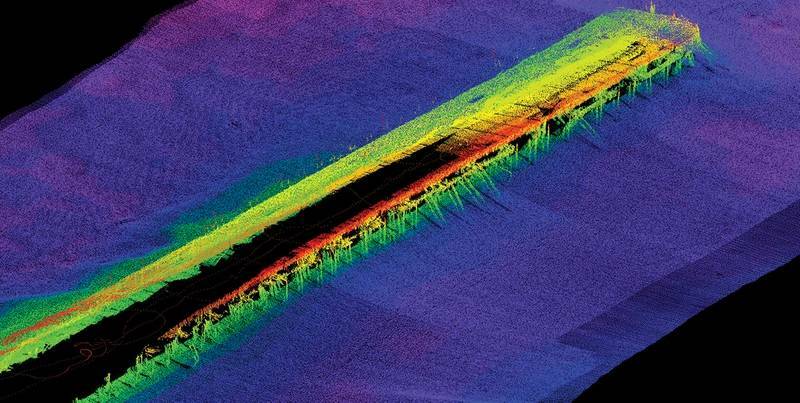 Figure 13 Combined survey lines from multibeam and singlebeam echosounders. 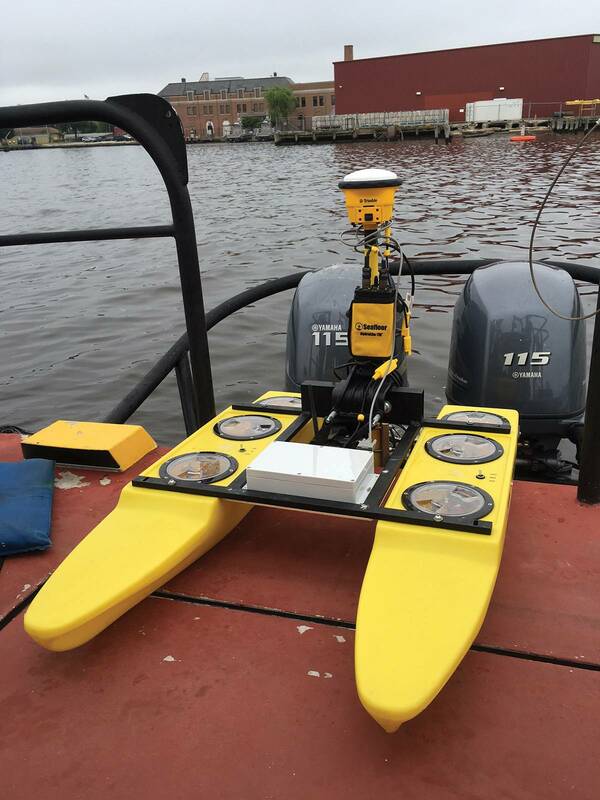 To collect high-resolution bathymetry around the dock, we employed the Teledyne RESON SeaBat T50-P™ Multibeam Sonar side-mounted on the US Army Corps of Engineers Baltimore District’s survey vessel. 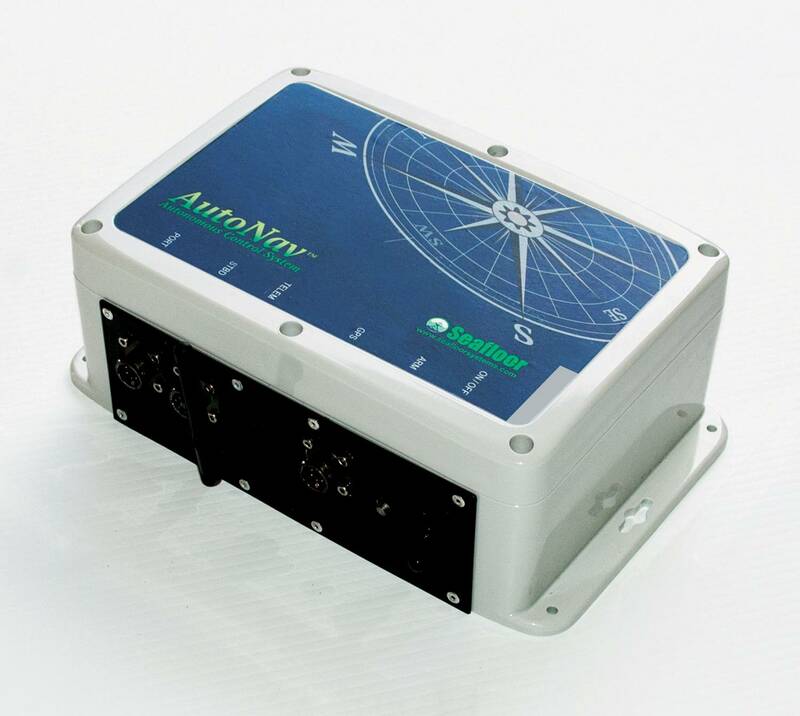 An Applanix POS MV was used for position, motion, and heading compensation. 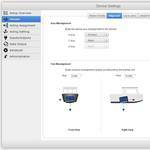 Data was collected in HYPACK/HYSWEEP Multibeam data Acquisition Software. The SeaBat T50-P, with its extremely high resolution performance, high sounding density, unique adaptive gates, and other performance enhancing tools made it an excellent choice to survey the complicated structure and produce an extremely clean and detailed data set with minimal editing. 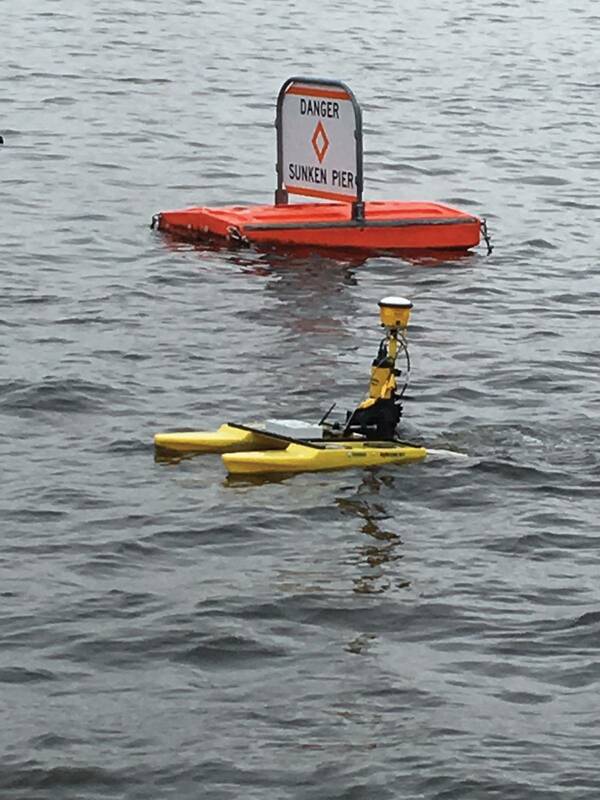 The SeaBat T50 was able to operate in the site’s water depths with a usable swath, translating to 7x water depth swath coverage; all data well within USACE’s most stringent requirements when statistically analyzing confidence vs. beam angle limits. 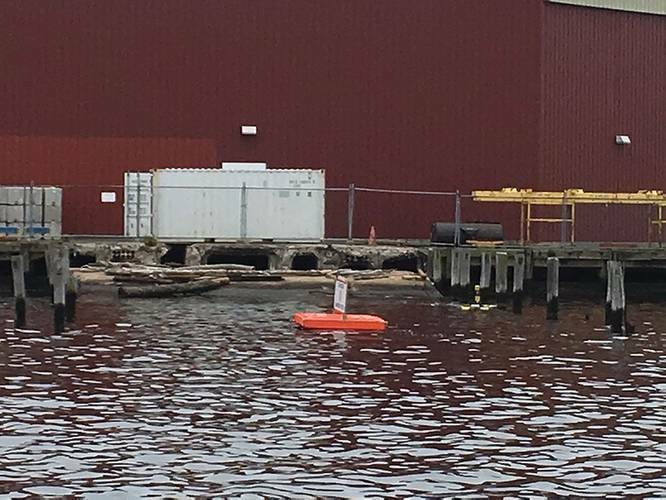 We knew getting soundings on the middle of the submerged dock was going to be a challenge. We employed the SeaBat T50’s electronic swath steering and sailed the boat as close to the dock as possible, but we still could not obtain soundings in the middle of the dock. The result was gaps in the data on the target area. Using point cloud renderings, the following images show different angles and views of the complete MBES data set. 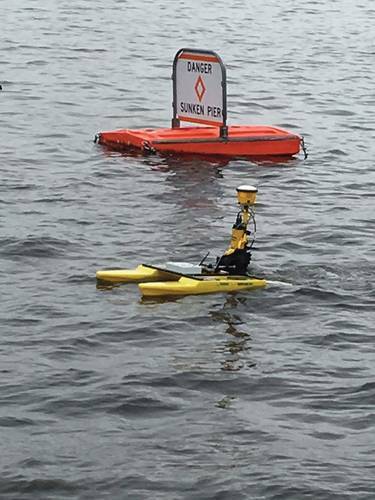 After completing the multibeam data collection effort, we launched our compact portable HyDrone™ Catamaran Survey Platform, integrated with the HydroLite-TM™ Singlebeam Echosounder Pole Kit, a Trimble SPS985 GNSS Smart Antenna for positioning, along with Seafloor’s Radio Telemetry kit to send both GPS and sounding data back, in real time, to a laptop running HYPACK on the USACE vessel. 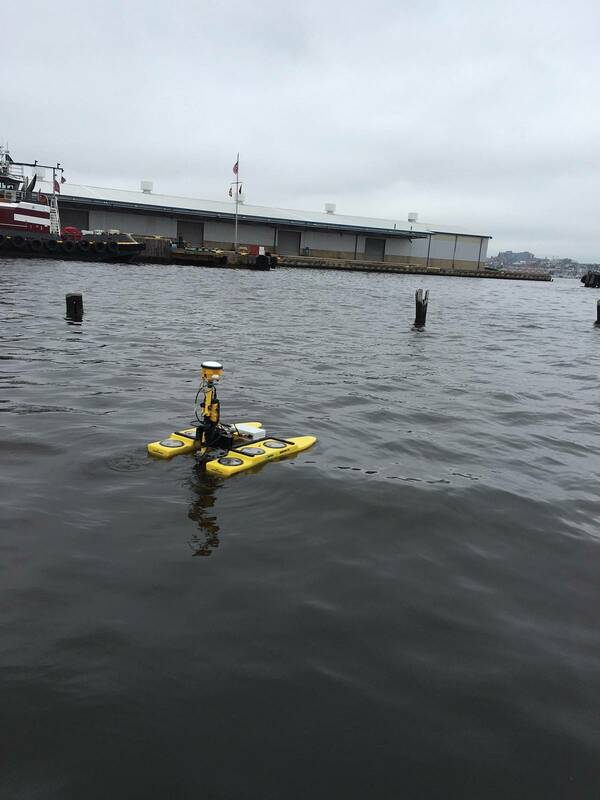 The HyDrone vehicle is designed and manufactured by Seafloor Systems as a survey platform to integrate our small HydroLite DFX Echosounder Pole Kit. This unique system offers the surveyor an ideal tool to access remote bodies of water, rivers with difficult access, or extremely shallow areas where launching standard survey boats or dinghies are not possible. 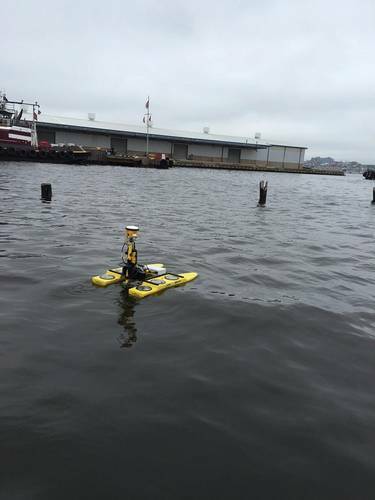 The HyDrone is ideal to map areas as shallow as 1-2’ depth via remote control, or fully autonomously. 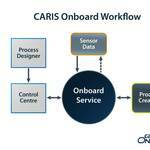 Seafloor Systems offers these vehicles with our AutoNav™ auto pilot module and Mission Planner Software,which allows the surveyor to pre-program the survey lines and customize waypoint routes that will be executed and surveyed autonomously. 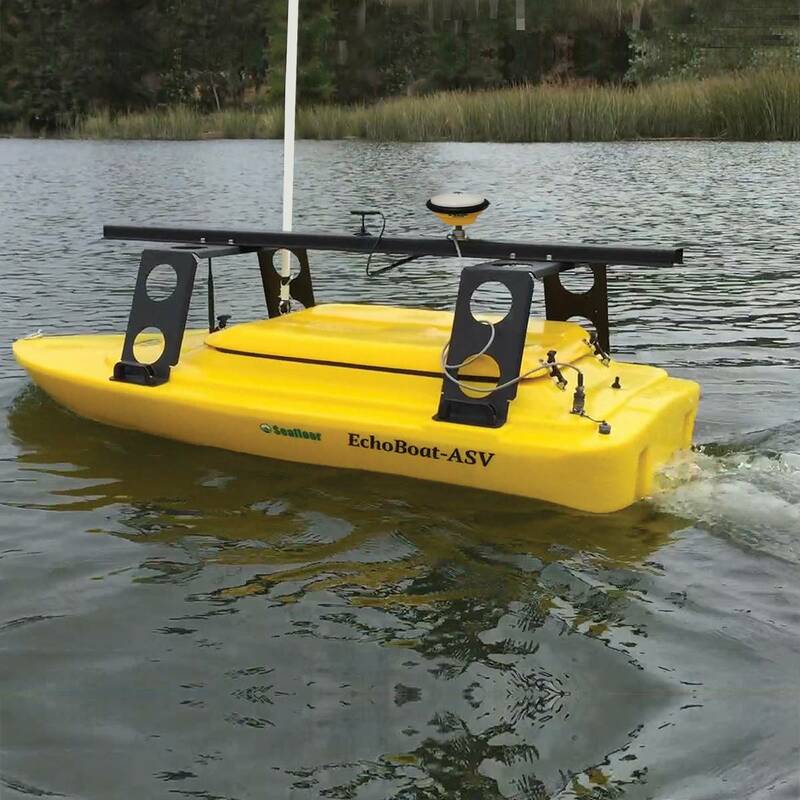 Seafloor Systems also manufactures a larger ASV, the EchoBoat, designed to handle a higher payload including a wider variety of sensors, larger dual frequency echosounders, small multibeam and sidescan sonars, as well as acoustic Doppler current profilers (ADCP) or imaging sonars. 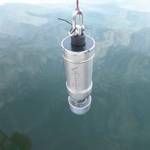 For this project, we determined the HyDrone-RCV was the better choice due to the shallow depths over the hazard. To obtain the missing data over the center of the dock, we operated the HyDrone in remote control mode, successfully navigating free-form contour lines and a center line-pass between the visible pilings and hazard marks. 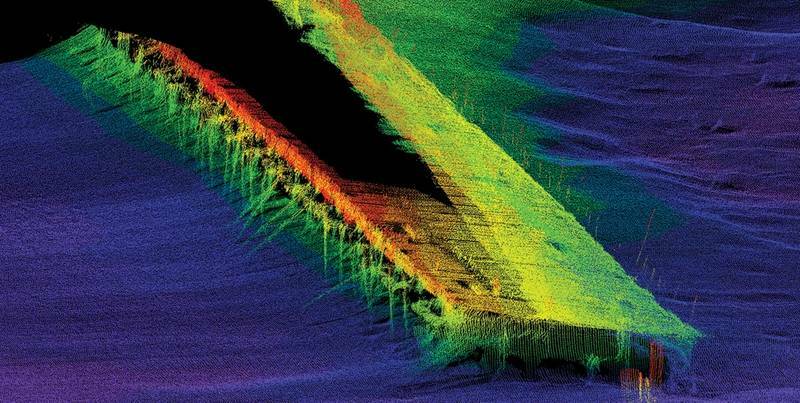 Despite utilizing an advanced, ultra-high performance multibeam sonar system, employing all its unique features and tool sets, the multibeam was not the complete solution to obtain the full picture of this hazard area. 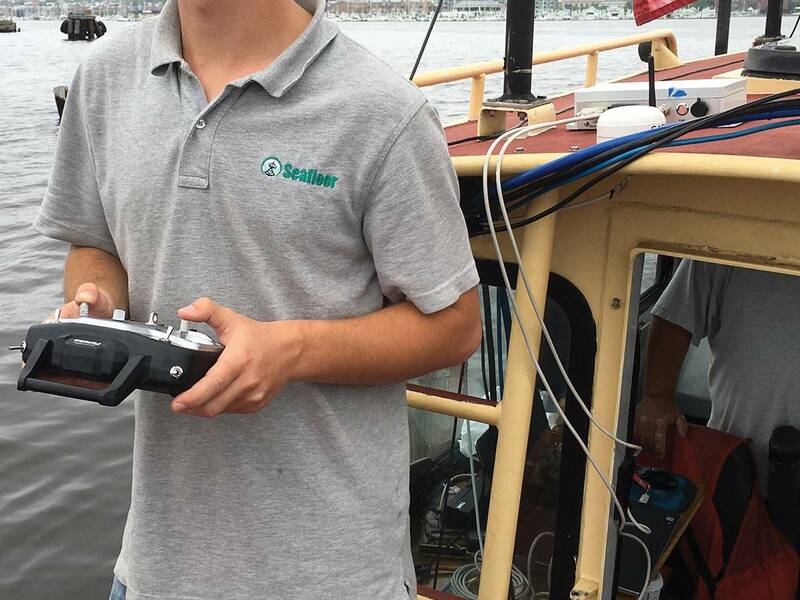 For this situation, we required the assistance of the HyDrone to fill in the gaps and complete the intended survey mission. 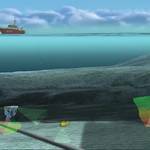 For maximum detail, we ran a total of five lines with the multibeam: two parallel lines along each side of the dock in opposite directions (giving the port and starboard beams the same view), and one parallel line to the end of the dock (creating a “U” shape). 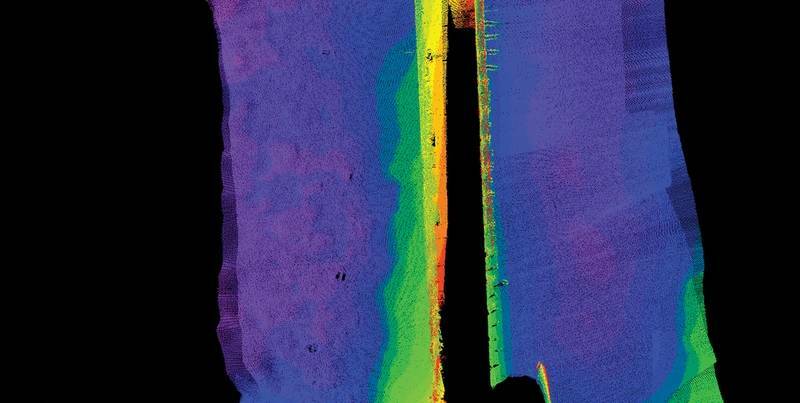 The HyDrone ran a few free-form single beam survey lines in and around the pilings, which can be seen from red dots in the screen shot. We merged the singlebeam data set with the multibeam data sets into single point cloud, using HYPACK software, to obtain a full picture, revealing the submerged dock. 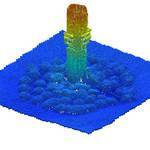 The image below represents the TIN model generated based off of cell spacing.